The changing inflammatory environment in adipose tissue with obesity. The progression from a lean to obese state leads to adipocyte expansion. The lean environment contains numerous leukocytes that play regulatory roles in maintaining low inflammatory tone in adipose tissue. These serve to buffer acute metabolic changes in adipose tissue nutrient storage and return the system to baseline. 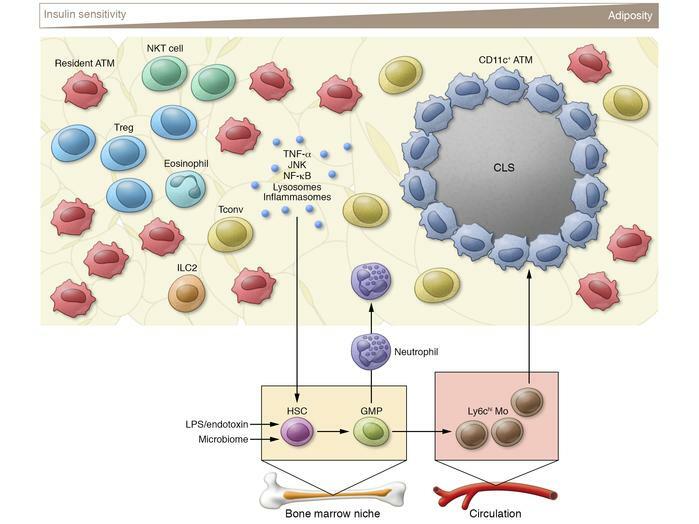 Chronic obesity leads to early events such as conventional T cell (Tconv) activation and neutrophil accumulation that enhance adipocyte damage and CLS formation. A high proinflammatory tone is triggered and maintained by signals from adipose tissue and the environment that drive HSC expansion and production of monocytes (Mo) and neutrophils from granulocyte/macrophage progenitors (GMPs). The net result is the sustained accumulation and activation of ATMs that potentiate continued adipose tissue dysfunction.